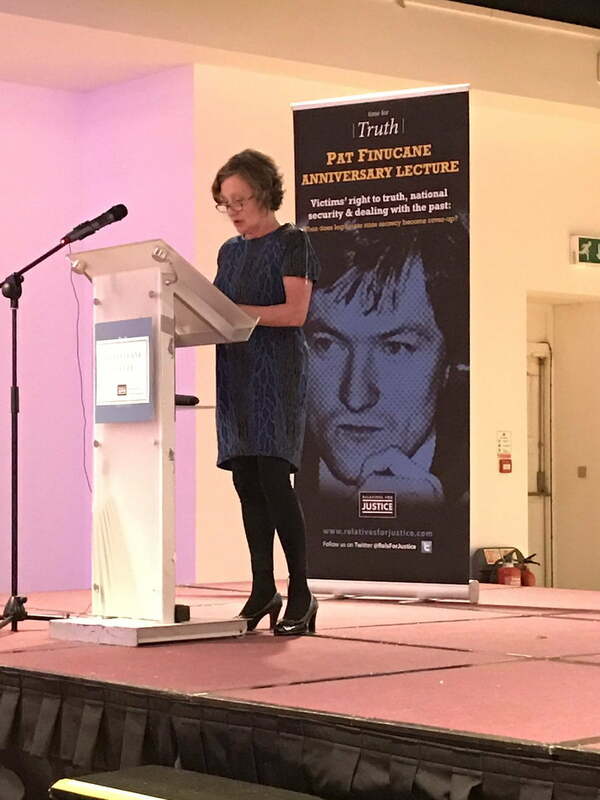 I am honoured to have been asked to deliver this year’s Pat Finucane lecture. I want to express my warm appreciation to Geraldine and the Finucane family, as well as to Relatives for Justice, for the kind invitation to make this address. 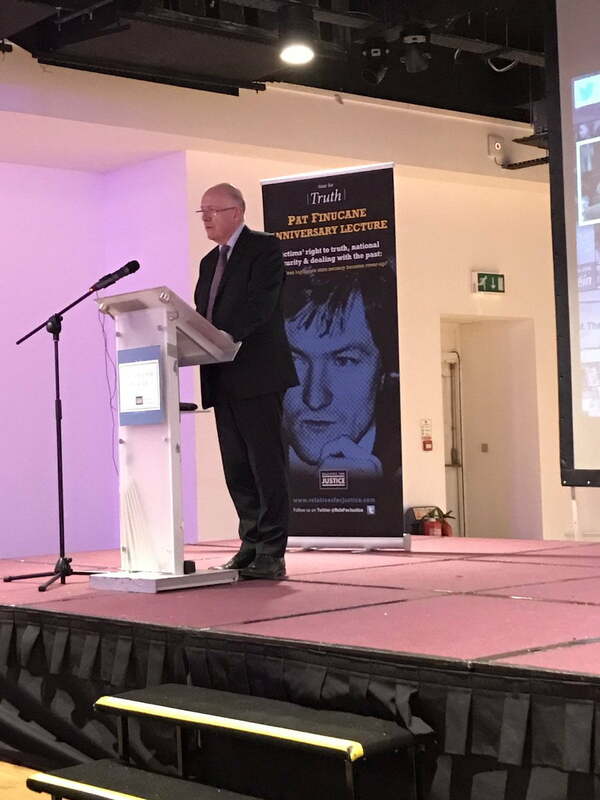 This annual lecture provides an important opportunity to mark the life of Pat Finucane, a remarkable man, but also to reflect on the past and, most importantly of all on the future. Standing before you all, 28 years since Pat’s murder and nearly 19 years since the Good Friday Agreement, I find that there is much to reflect upon. Political and indeed legal and constitutional developments – not just on these islands but around the world – have come at us thick and fast since former UN Special Rapporteur Frank La Rue addressed this gathering last year. However, some things can and will remain constant; namely respect for the rule of law and the protection and promotion of human rights for all. My remarks this evening will focus upon these principles and how they apply to some of the challenges facing us today, particularly as we look to comprehensively address the legacy of our troubled past. Over the past few months and years I, like many of you, have been immersed in the detail – legal and political – of these questions. When preparing for tonight it struck me that the public discourse has also become quite focussed on this detail and perhaps there is a need to take a step back and remind ourselves of the bigger picture. Discussions about how we will handle legacy issues are vital, but they will only succeed if we are also clear about why we need to do so. Perhaps too many things have fallen into the category of ‘it goes without saying’ and tonight is a good moment to say some of these things out loud. We must use the lessons of the past to secure a better and truly shared future. At the heart of all of this – and central to our gathering here this evening – is the rule of law and respect and support for those who uphold it. As a solicitor myself, I remember the shock which the murder of Pat Finucane, and later of Rosemary Nelson, caused amongst the entire legal profession on this island. As with any murder, these killings visited tragedy upon families and violence upon society; but this was further amplified by the chilling sense of an attack on the law itself. As a legislator, my function is to make the laws but I am always mindful that the harder part falls to those who every day must operate and defend those laws whether it is in enforcement, advocacy or adjudication. To uphold the law in accordance with the highest standards without fear or favour is as much a vocation as it is a profession. As such it is deserving of support and respect from parliament, from government, from media and from society. Those officers of the law who must work in the full glare of the public and political gaze must be allowed to do their duty without attacks on their personal or professional integrity – much less their lives. It is our duty to create the conditions under which the law can operate without fear or favour. As we assemble here in the week of Pat Finucane’s anniversary, the past is far too near and its echoes should be far too loud for this lesson to be forgotten anywhere on these islands. It is that same respect for the rule of law and the protection and vindication of the human rights of all that underpin the architecture agreed by both Governments and the five main political parties back in 2014 at Stormont House. In the intervening two years, the detail of how the different institutions within this architecture will operate has been much discussed in private and in public. During that time we have seen debates about what will – and will not – be covered or focussed upon and a great deal of discussion about the meaning of concepts like ‘fair’, ‘balanced’ and ‘proportionate’. I want to make absolutely clear that the Stormont House institutions set out a comprehensive, inclusive approach to dealing with our troubled past which also meets the obligations on State Parties – including the British and Irish Governments – under the European Convention on Human Rights. So what does that mean in real terms and in plain language? It means that those of us in positions of authority must challenge ourselves and our own personal experiences and politics, for the greater good. It means there can be no hierarchy of victims in this process. Regardless of who someone was and regardless of what they were doing there is a requirement to effectively and meticulously investigate their death. It is not for Governments to say to the bereaved that their loss or suffering is of greater or lesser worth than that of their neighbour or even their adversary. Similarly, let me say clearly, there can be no amnesties. If a killing has taken place it must be properly investigated to ascertain if it was unlawful and thereafter – if the threshold of proof is met – a prosecution legitimately, actively and vigorously pursued. Given some of the misinformation that is in the public domain around this issue I understand how concerns about a perceived imbalance may have arisen so let me address that. This process is not about seeking to find an artificial balance or equivalence but about ensuring that we have a comprehensive approach. That means looking at all Troubles related deaths regardless of who the perpetrator was. The statistics in that regard speak for themselves with the vast majority of those who lost their lives killed by paramilitary groups. Having said that, I would always caution against any effort to make discussion of these issues a numbers game. Behind each of those numbers is a person and behind that again the grief of a family and a community. We are here tonight with one such family. A family which has suffered the loss of a husband, father, brother. A family whom we have got to know as – with great courage, dignity and resilience – they told their story. Geraldine, I would like to acknowledge your family’s grief. Your enduring loss. And pay tribute to your quest for truth, which I know has been painful. And in acknowledging this family, the Finucanes who only this week experienced a fresh disappointment on that ongoing and difficult quest, I would like also to acknowledge all those families affected by loss arising from the Troubles. Some families are well known. Some are not. Some families are vocal, others silent. All are equal in their grief. There are many thousands across this society who bear scars, physical and mental. I acknowledge them all. I want also to acknowledge the many men and women on both sides of the border who performed their duty to protect the public with diligence and honour throughout the Troubles. Their service has not and must not be forgotten and there is no contradiction in my mind between this acknowledgement and the need for a cleared eyed holistic approach where collusion and other wrong doing is also identified and pursued. This approach is reflected in the framework agreed at Stormont House. It has also informed the Irish Government’s attitude over many years to the McKerr and Others group of cases at the Council of Europe in Strasbourg, including of course the case of Pat Finucane. While working closely with the British Government and the political parties here on finding a way forward on the Stormont House Institutions, we have consistently underlined that the responsibility for implementation of these judgements, through an effective investigation rests with the sovereign Government. In this regard, I remain acutely concerned about the failure to properly resource legacy inquests and would again urge the British Government to implement the proposals of the Lord Chief Justice. This would fulfil the outstanding Article 2 obligations in response in respect of these 56 outstanding cases and provide much needed trust and confidence in our collective capacity to address legacy issues. From my own participation in the Stormont House talks in late 2014, I know that the issue of legacy inquests was seriously complex, sensitive and difficult. It is to the great credit of the Lord Chief Justice that he took personal responsibility to prepare and bring forward proposals to address this issue – proposals which have earned the confidence of the relevant families. I commend his initiative – an initiative that surely merits the necessary political endorsement and appropriate resourcing. Last December the Government reiterated its support for the reopening of individual measures in the Finucane case. This reflects our belief that had the Committee of Ministers been aware in 2009 of the existence of the new and significant information relating to the murder, which came to light following the de Silva review, it may not have agreed to the closure of individual measures. The firm view of the Irish Government remains that a satisfactory outcome to this case will best be achieved through a full public inquiry. I want to underline that this is not about making a special case of one victim but rather about the importance of honouring commitments made – in this case by the British Government at Weston Park – almost 16 years ago. Honouring commitments and living up to agreements is an area where we have all fallen short when it comes to addressing the legacy of the past. It has been 10 years since the Eames/Bradley report and I am keenly aware that victims and survivors, and indeed society as a whole, have been through the promise and the dashed hopes of several processes since then. I remain convinced that the institutional framework in the Stormont House Agreement now offers the best way of bringing whatever healing is possible to those bereaved and afflicted by the Troubles . I am keenly aware of the disappointment and shock felt in November 2015 when it was not possible to have the detailed outcome on legacy we had hoped for in the Fresh Start Agreement. My own Department’s engagement over the past year with a wide range of victims and survivors groups has further strengthened my resolve to see this architecture put in place as soon as possible. I want to assure all of you that the Irish Government remains strongly committed to continuing to work with the British Government and the political parties in Northern Ireland to this end. The few but significant outstanding issues must be resolved, so that the Stormont House institutional framework on the past can be agreed and legislated for as required, in the UK and Ireland. This work will require intensive political engagement, commitment and a spirit of compromise, if victims and survivors are not to be let down once again. The Irish Government will not be found wanting in this regard. The time is now because the need is great – for individual victims and survivors but also for the vital work of healing and reconciling society. We need only open a newspaper or turn on our televisions to demonstrate the impact which the legacy of the past is having on the present and therefore the future. The weight of what has gone before encumbers policing, politics and the judicial system in a way which is neither desirable nor sustainable. We all know that we need to do something differently and the Stormont House institutions offer us that possibility. When I speak of healing – I do not mean that there will be perfect outcomes – of course there will not. But there will be equality of access, something which is clearly lacking now. The architecture also opens rather than closes avenues with investigation and truth recovery both available to those who choose to pursue them. The question we should ask ourselves is not whether these legacy institutions will be flawless and satisfy every victim and survivor? Clearly they will not. Rather, it is whether they will be better than a status quo that does not deliver for victims, places massive burdens on the policing and judicial systems and shows no signs of becoming fit for purpose. In contrast to a failing status quo, implementing the Stormont House framework offers us a credible prospect of advancing access to justice, providing some measure of truth and promoting reconciliation, in the interest of the public of this island and these islands. When I speak of justice, I do not mean retribution. A fair and impartial legal approach to our difficult recent past will help us achieve a more just society and contribute to building the better, peaceful island we all desire. We should do all of this and more– although it will be uncomfortable and difficult – so that we can contribute to a better and a more reconciled society. That is our public interest. The constancy of Geraldine Finucane and her family in honouring the memory of Pat Finucane, and in seeking truth and justice on his behalf, should renew our determination to finish the job set out in the Good Friday Agreement almost two decades ago and to now establish the legacy institutions for dealing with the past. To honour our commitments to the victims and survivors and for the benefit of wider society. I am honoured to be able to address you tonight, some 28 years since the murder of my husband, Pat, a solicitor, who was born and bred here in Belfast. He was murdered by Loyalist paramilitaries, in our home, on Sunday, 12 February 1989. I would like to say that the passing of the years has made Pat’s death easier to bear but his would not be true. In fact, the more time that passes, the more difficult it is to bear his loss. This is partly because of how much we miss him as a person but it is also because of what we now know about the circumstances surrounding his murder. We know, beyond any doubt, that Pat was murdered with the active assistance and participation of the former Nl police force, the RUC, the British Army and the British State. There was a time when we did not know as much as we do now and the claim that Britain was involved produced scepticism in many quarters. Politicians in government and officials in state positions at home and abroad disbelieved our suspicions entirely. Some even poured scorn on our allegations of state collusion and said the ideas were fanciful. Sadly, Mr. Justice Stephens concluded that the decision of the British Government was not unlawful and so he was unable to order an inquiry. We appealed this decision and on Tuesday, the Northern Ireland Court of Appeal delivered its judgment on our case for a public inquiry. Sadly, we were, once again, unsuccessful but there may yet be grounds for a further appeal. Where, then, does the case for a public inquiry into the murder of Pat Finucane rest? The courts have concluded that they cannot order an inquiry. The British Government has determined it will not hold one. Perhaps all that can be done has been done already …? Perhaps the murder of Pat Finucane is simply, ‘old news’…? I do not think that the controversy surrounding the murder of Pat Finucane has been properly resolved. I believe I am right in this, not just because of a broken promise by the British Government but because of the unanswered questions that arise from Pat’s murder and the fact that no-one within the British establishment has ever been made accountable for it. I believe I am right because the Irish Minister for Foreign Affairs is here tonight and has spoken, on behalf of the Irish Government, of their continued support for a public inquiry. Most of all, I believe I am right because of the unwavering support my family and I have had from the people of Belfast and beyond for the last twenty eight years. I see many people here tonight who have stood with us for all of those three decades, helping us out, urging us on. I meet them often, at events such as this or just when I am out and about my daily business. I am constantly approached by people who wish me and my family well. They tell me we are doing great work. Some people even tell me that they have known tragedy in their lives but were unable to follow through on it, for various reasons. But they gain comfort and some degree of closure by knowing that someone is holding the British State accountable for their actions. This is why we do what we do. This is why we keep going. It isn’t easy. Many times, over the years, we have felt like we have no more left to give. Like we are fighting an unbeatable enemy. Like the obstacles before us are insurmountable. It is at times like those that my family and I take strength from two things. One, is the path that lies behind us, which helps put the obstacles ahead in perspective. Of course, this is not the first time there has been official recognition of the true nature of Pat’s murder. Others have said similar things, over the years. But I believe that the statement of Mr. Justice Stephens in the High Court in Belfast is significant. It is where Pat himself worked, where he plied his trade, where he represented his own people. And it is perhaps the recognition that would have brought him the most satisfaction because convincing people in your own back yard is often more difficult than anywhere else. However, we did not have to convince everyone that we were right. This is the second thing that keeps us going: the people who believed us, right from the start, who knew there something rotten in the British State, and who have supported us for so many years. Pat’s friends; Pat’s community; Pat’s own people. We have been encouraged and supported and helped by so many people when the going got tough. And the reason we keep going and can keep going, is because of all that help and support and because there are so many people who want us to. There are so many people, who, like us, want to find out the truth behind Pat’s murder. It is unfinished business for them. It is unfinished business for us. I want to know, why. I want to know, how. I want to know, who. I want to ask my own questions and I want to hear the answers for myself. I want to read the documents and understand the frameworks. Most of all, I want to be able to show them to the entire world so that everyone can know and learn what can be done by governments in the name of the people if we are not vigilant. Most of all, I want to share that accomplishment with you, Pat’s own people, so that, together, we can turn unfinished business into finished business. I owe you all a great deal for your support over the years. I would very much like to share the final achievement with you also.